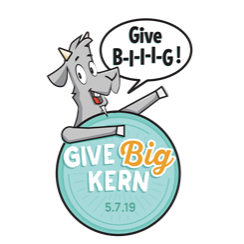 Give Big Kern, “One Day to Celebrate the Giving Spirit of Kern County!” is observed on the first Tuesday in May — which falls on May 7 this year. But for early birds whose desire to give to local charities is already burning a hole in their pockets, Give Big Kern organizer Kern Community Foundation opened the givebigkern.org donation portal a whole month in advance, beginning April 7. And for procrastinators, givebigkern.org will remain open until midnight on May 8, to allow for an extra 24 hours of giving. According to research from Ithaca, N.Y.-based GiveGab, KCF’s technology partner that designed and powers the givebigkern.org site, as well as some 200 other giving day efforts across the nation, while the majority of dollars raised (71 percent on average) come in on giving day, 13 percent are donated pre-giving day, and 16 percent post-giving day. Keeping a giving day campaign open longer is a way to capture as many donations as possible, GiveGab CEO and Co-Founder Charlie Mulligan told a group of about 50 nonprofit leaders during a visit to Bakersfield in early March. Some Tehachapi/Caliente area organizations that are participating this year include Heritage Oak School, Have A Heart Humane Society, Marley’s Mutts Dog Rescue, and Equine Rescue Outakuntrol. KCF is still accepting monetary sponsorships ranging from $1,000 to $20,000 until April 16. Sponsorship dollars pay for the production of free marketing materials distributed to participating nonprofits, the development and hosting of the Give Big Kern platform, and, very importantly, cash prizes that are awarded to participating nonprofits that excel in fundraising, volunteer recruitment and board engagement. Interested corporations may contact KCF’s Director of Community Impact Louis Medina at Louis@kernfoundation.org or 616-2603. Louis Medina is director of community impact at Kern Community Foundation.